Welcome to the 23rd issue to subscribers of Right Writing News. If you are reading this issue forwarded from someone, be sure and use the link below to get your own free subscription. 4) Fishing for An Agent? 8) Kickstart Your Career With a Magazine Credit! Every writer struggles to understand rejection. You have a brilliant idea and craft a query letter or a book proposal. Then you come up with a list of possible book publishers and submit your material. Then you wait (some times months) for an answer--which comes from the editor. And it's a form letter with nothing personal and no insight for you to improve on the next submission. I completely understand the unfair nature of a form rejection letter. I dislike sending these form letters but as an editor, I have little choice. It's not my responsibility to critique the writer's work or tell them why I returned their work. Also there are simply not enough hours in the day to accomplish even a brief specialized note to these authors. Since January, I've rejected over 350 submissions with my part-time editor role. You can assume the volume of submissions is even higher many other places. You want to manage your own expectations about receiving any details from the editor about the reason for the rejection letter. I continue to receive rejection letters for my own submissions--often form letters. Now many writers will resist seeing the rejection letters. If they have a literary agent, they feel like they don't need to see these letters. It's not true in my view. If I work with a literary agent, I encourage that agent to send me the rejection letters. Why? Then I know my materials are being submitted--and processed through the publishing houses. It's frustrating to ask an agent about your book proposal and hear, "I showed it all around and everyone passed." Who is "everyone?" The rejection letters give validity that the agent is indeed working for you. I've dissolved my relationship with agents who don't send rejection letters when I'm one of their clients. It's something else to consider in your own relationship with a literary agent. 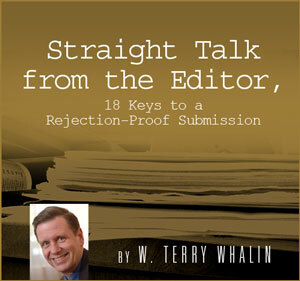 Out of my own frustration about not being able to respond to writers and give them reasons, I wrote Straight Talk from the Editor, 18 Keys to a Rejection Proof-Submission. This new Amazon Short gives six keys why book ideas are rejected, six keys to guarantee rejection and six keys to gain the editor's attention. Now you know how I came up with 18 keys in this original piece. I could have used this article in many other ways. It could have appeared as a magazine article or as the first chapter of a new book project. Instead, I sent it to Amazon.com for their Amazon Short program. It's not free but at 49 cents, it's certainly affordable for every person and you receive it instantly as a PDF download. It's part of my ongoing commitment to educate writers and help them understand how to improve their submissions and distinguish their submissions from others. I hope you will check out Straight Talk from the Editor, give it a Five Star Review on Amazon--and tell all your writer friends about it. My greatest hope is for you to study these words and apply them to your writing life. We need more writers who understand the process and can give editors what they need. It's the editor's hope for each email and each package. When the rejections pile up, it's easy to grow discouraged. Every editor and every literary agent that I know is actively looking. The key is giving them the right project at the right time at the right place. How would you like to have a brief writing tip on your own website--which automatically changes every day? If it sounds impossible, it's not. It's just as close as cutting and pasting a small amount of computer code. If you can cut and paste, then you can put this tool on your site. I've attempted to create short (one or two sentence) writing tips which will be applicable to all types of writing. The date and the tip automatically update each day. If you have a website or a blog, it's easy to paste this code into your blog. If you want to see it, check out The Writing Life--and look in my sidebar (the right-hand column). The tool has 31 tips but will soon expand to additional tips. I'd love for you to use it and my hope is that it will help many people. Several weeks ago, I chatted for two hours at the Institute of Children's Literature website about book proposals. I was typing and teaching as fast as I could go during this session. Now the transcript is available and it's eleven pages. I hope you will check it out and find it as useful information for your own writing. Finally, on National Author's Day, November 1, I did an early morning radio interview with Scott and Lorri (Mornings with Scott and Lorri on Sirius). We talked about Book Proposals That Sell. This interview is stored in a podcast format and available for you to download. OK, this article includes three resources. I'm eager for others to use the Writing Tip of the Day. I hope it will spread like wildfire across the Internet to help many people. As an editor and a writer, I've learned the truth of the saying, "The Devil is in the Details." If you run an amazing article in your magazine yet spell someone's name wrong, that's what you are going to hear about. The details are important. Whether I'm writing a query letter or producing a newsletter, I want to make sure the format is right. I don't want to use some strange typeface or misspell the name of the editor. Many times in the last few years, I've received query letters or cover letters to manuscripts addressed to Ms. Terry Whalin. I understand Terry is a name which can be male or female (it happens to be a last name in my family tree). As the writer and editor, it's my responsibility to get these details right--so if you need to call an editorial assistant to check the spelling of a name or find out whether to use Mr. or Ms., then invest the energy--to get these details right. Another element I think about is the title or headline. I want to make sure I have a short, attractive, punchy headline for my articles or title for my book manuscript. The editor will recognize whether you've made this type of effort or not. I've learned if I have a catchy title for my book manuscripts, often it will be used on the printed book. Because I've been a book editor, I understand the publisher controls the title for the book or the magazine article--yet at the same time, I know that if I have a great title, the editor will use it. Michael Green has some great reasons that people read newsletters or don't read them in this article. As I put together a newsletter or a query or any other type of writing, it's always good to take one last look at it--to check the details (pagination, title or headline, typeface, use of bold, italics, underline, etc. and finally to make sure you've included all the necessary information). You'd be surprised at the number of submissions I've received where the person has obviously found my address online--yet not included an email addresses or SASE for a response. The most difficult aspect to proofread or see is something that is missing. It's always worth one more look before you hit that send button. Most aspiring authors begin their careers with little or no understanding of how to go about finding an agent to represent their work. They quickly learn that most major publishing houses only accept submissions through literary agents. So, with great anticipation, they begin sending query letters to agents and usually get a cool reception, or even hit an impenetrable brick wall. To understand how authors can improve their odds of attracting an agent, and to learn the outlook for rookies trying to crack into the brutally competitive publishing industry, we surveyed more than 60 literary agents. Their backgrounds range from large, well-known agencies to smaller "boutique" agencies. We think our survey results and agent comments offer some good insights for all types of writers. It is no surprise that referrals from the agents' current clients were the top method cited. Publishing is a relationship-based industry, and contacts are extremely important. A recommendation from someone whose opinion an agent trusts is always valued and receives prompt attention. Several top-selling authors' careers were launched when another bestselling author took them under their wing and introduced them to agents or publishers. What might be surprising is that as many as a third of the agents said direct contact from the writer was the most common way they found new clients. So, most definitely, there's hope for all the authors sweating blood over the last draft of that perfect query. What is the most critical mistake writers make when approaching literary agents for representation? It's curious that agents report getting so many weak query letters, since a number of books deal with the subject, including Making the Perfect Pitch by agent Katharine Sands, and many writers conferences cover the topic in depth. Once you see some examples of successful queries, it isn't really that complicated to compose your own—particularly compared to the task of writing a long novel. "Declining to divulge the contents of their manuscripts in their queries—they just don't get that it's the writing, not the ideas." "Writing a clumsy, uninformative, grandiose, marketing-heavy, casual or just poorly composed query letter." "Not being professional, succinct or specific, and for inexperienced novelists they most often have what I call the ‘first 50-page ho-hum.' The story really begins somewhere between pages 56 and 100. This is a downfall which crosses my path more often than it should." "They don't know the components and priorities for writing a good pitch letter, especially about listing their professional credits up front." Agents report that creative people often have big egos. Hard to believe, isn't it? Part of the problem stems from the authors' awareness of how many other writers they are competing with for the agent's attention. The temptation to use hyperbole to differentiate oneself can be overwhelming. A significant number of the agents warned against overselling and arrogance—"Trying to act more like a sales person, and not like a writer," as one agent put it. "Hyping the agent. A straightforward recitation is much more effective." Yet, others said the worst mistake was "Not writing an engaging query," or "Writing dreary query letters describing the plot of the book." Now we're starting to get confused. Do the agents want an exciting query or that "straightforward recitation"? Most likely they want both. The author who is truly talented and dedicated to the craft of writing has a clear advantage right from the start, since the overwhelming response from agents was that the quality of many submissions they receive is poor. But the author who can articulate the market for his or her book is also way ahead. The author needs to think of himself as a small businessperson entering a new industry, not as a "literary artist." Prospective authors must be able to address the question: Who is going to buy my book and why? Writers should not assume that an agent or an editor will automatically recognize the target audience for a book, or how large that audience might be. Authors who can show they'll be helpful and energetic in selling the book once it is published are particularly sought after in today's market. "They fail to think about who the audience is for their book, and how best to reach that audience in real (as opposed to airy-fairy) ways. Lack of original thinking . . . lack of professionalism in that they have no real clue how the industry works or what an editor or agent does for a living." "Less a mistake in approach, more a mistake in knowing what makes a publishable book. Most writers really don't know." What is the most common reason you decline to represent a writer? The good news is that the top two reasons given are factors under the writer's control. Most authors develop and improve their craft over a number of years. An aspiring author certainly doesn't have to remain in that "poor writing" category forever. But what exactly is "poor writing"? In the decline letters they send to authors, agents often say they turned the author down because they aren't enthusiastic enough about the material. A favorite phrase they use is, "I simply didn't fall in love with the writing." This is probably the source of more author frustration than any other aspect of getting published. Success or failure hinges on extremely subjective judgments. Think about your own reading experience. How often do you pick up a novel, read 10 pages and decide you aren't interested in it? Does that mean the writing was "poor"? Not at all. It simply means you didn't connect with the story. Every individual's literary taste is different. One frequently received type of rejection isn't really "rejection" at all: The agent has all the clients she can handle at the present time, so she really has no choice but to send a decline letter to unsolicited submissions. The agent in this case was doing the author a favor; it would have been far worse to accept a new client who would receive inadequate attention. Too often, though, authors interpret such a decline letter as meaning "my book must not be any good." Actually, the agent may not have even had time to read the submission package. An encouraging note is that the agents' answers here indicated that the fact a writer was unpublished was not a significant reason for rejection. "Publishers don't know how to sell books. They've continued to lose money. Now they think the only way to be sure to sell books is by buying names that are known. This is not the correct way to think, however. And perhaps within the next five years they will get it." "Editors no longer rely on their instincts and passions as selection criteria; instead they go by such formulas as Bad Numbers, Author Has No Platform, etc." "Because of the pressure of the chain buyers, publishers are increasingly locked into publishing only the new authors with no record and bestselling authors." " . . . As long as the retail market continues to consolidate in the hands of fewer and fewer retailers, the entire industry becomes dependent on the taste of a small handful of ‘buyers' who choose which books get shelf space." "What does keep projects from being bought is the fact that lists are shrinking, and in a marketplace in which it's terribly hard to win anyone's attention—from buyers all the way to customers—everyone up the editorial chain is anxious about making the wrong bet ... more often than not, ‘no' is a safe answer." " [The publishing industry is] for unpublished writers who have a brilliant first novel to offer or a nonfiction platform. It is against unpublished writers who are bad writers (or, in the case of nonfiction, are not credentialed in their field, [or don't] have a new original, high-concept idea, etc.)." "The industry is not a monolithic thing. Some genres (nonfiction especially, which more and more requires the author to have a major platform for promotion and media attention) will continue to become more difficult, [while] some genres (upmarket fiction) exalt first-time writers. The ‘first novel' for literary fiction represents a unique marketing opportunity for a publisher; it's the second and third novels that tend to be far more difficult to publish well if the first doesn't take off." First of all, study the elements of a good query letter. Make yours succinct and positive, but not obnoxious. Stress that you understand the market for your book and how to reach it. Include your credentials and writing credits. Learn what agents are looking for and query the agents that match up best with your topic or genre. Polish, polish, polish your pitch. Use every chance to meet people in the publishing industry. Don't take negative responses personally. Don't give up. Perseverance is the critical, but often unheralded, element of publishing success. Brian Hill and Dee Power were inspired by their own publishing experiences to research and write The Making of a Bestseller: Success Stories From Authors and the Editors, Agents and Booksellers Behind Them,. Hill and Power have also co-authored two other nonfiction books, and several screenplays currently being considered in Hollywood. They have just finished a novel, Treasure in the Moonlight. They can be reached through their website http://www.BrianHillAndDeePower.com, This article originally appeared Writers Magazine March 2005 and is used with permission. You finally did it. You managed to get through the gatekeepers and a literary agent (or perhaps even better, an acquisitions editor) is reading your book proposal. Congrats! Well, sort of. Now the question becomes: Is your proposal going to wow him or her? Do you have the "goods" needed to land an author and publishing contract? Before uncovering the science of the book proposal, you must understand the editor's decision-making process. Is there a market for this book? Is this concept unique and differentiable from other books in its genre? Does the author have a platform and the expert status to sell this book (assuming it's a work of nonfiction)? This might seem overly simplistic, but before you begin your writing project, it's advisable to take a substantial amount of time to answer these questions. Search Amazon.com for keywords related to your project. Read the book descriptions. Are they similar to what you want to write? Is your angle different enough to warrant another book on the subject? Check out the customer reviews and the sales ranking. How well are similar titles doing in the marketplace? Additionally, in today's competitive landscape, not having a viable platform to sell books can, unfortunately, keep a lot of great books off the market. Publishing is a business. Publishers try to determine which books will be profitable for their company (and they are wrong more than 60 percent of the time, so don't take it personally). Many new writers think the purpose of their first book is to help build their platforms, but publishers generally don't see it that way. This catch-22 often leads writers to self-publish their works in order to build momentum, which is oftentimes the best option. If you have considerable momentum in building your career as a "solo-preneur," speaking actively and generating some media attention, an author and publishing contract may be right around the corner. The above article is an excerpt from the guidebook included in Everything You Need to Know to Become a Best-Selling Author. During the early stages of a writing project, when you're gathering ideas and deciding on your approach, it's useful to daydream and be unfocused in your thinking. However, there comes a time to focus, to fully concentrate on the work, as if you were putting a beam of sunlight through a magnifying glass to concentrate its power until the paper it touches bursts into flame. When you focus, you'll accomplish writing projects in half the time, and your concentrated efforts will produce better work. Focusing also builds momentum and enthusiasm, urging us to move steadily toward finished stories, articles, and books. Being able to focus is critical. As Stephen Covey (author of The Seven Habits of Highly Effective People) says, "The main thing is to keep the main thing the main thing." What keeps us from focusing? Distractions. They have always been with us. Agatha Christie once said, "I enjoy writing in the desert. There are no distractions such as telephones, theaters, opera houses and gardens." While our modern-day distractions may have changed a bit (e-mails to answer, faxes coming in, the World Series on TV), the result of being sidetracked by them remains the same. We don't finish our writing. We don't study guidelines and mail that manuscript. We don't follow up on marketing tips. If we stall long enough, we may quit altogether. So how do we deal with things that take us away from our writing? Try adapting the Serenity Prayer for this purpose: "God, grant me the serenity to accept the distractions I cannot change, courage to change the distractions I can, and wisdom to know the difference." What are some distractions you cannot change or ignore? Sometimes it's a sick child or spouse or a crisis with a friend. Sometimes your boss gives you an overtime assignment with a "now" deadline. There may be a project that needs to be attended to without delay, like your teenager's last-minute college entrance application. This type of interruption or distraction you have little control over. You grin and bear it. However, we need wisdom to know the difference between the distractions that are unavoidable and those we allow. Chances are, you're your own worst enemy when it comes to distractions that keep you from writing. So take courage! Change what you can in order to focus on your writing. 1. Use an answering machine to screen calls. Better yet, turn the ringer off altogether so you're not tempted to pick up when you hear your best friend's voice. Then return calls at lunch time or when you've finished your daily writing stint. 2. Isolate yourself as much as possible from the traffic flow. I now have my own office, but I've written in family rooms and bedrooms and dens. The family room was the most difficult with constant interruptions of TV, kids, and doorbells. The more you can shut the door on distractions, the easier you'll find it to focus. 4. Leave the mail alone. Reading letters and e-mail can be a major distraction. It interrupts your flow to stop and sort the mail. And if your mail contains rejection letters, bills, and bank statements, it can create an instant slump. So get the snail-mail if you must, but stash it in a basket until the end of the day when you're done writing. The same is true for e-mail. Leave it unopened and unread till late afternoon (unless it's a response from an editor!). 7. Organize your work space first. Arrange your work space before you begin writing, to ensure that you have everything you need. Don't run out of paper halfway through typing your chapter. Keep things within reach. Even finding a new ink cartridge or box of paper clips in your supply closet can distract you. Before you know it, you've spent half an hour rearranging the closet shelves. 8. Silence can be golden. Are you as distracted by noise as I am? I run a fan on high speed for white noise, and during school vacations I also use ear plugs. If traffic bothers you--or if you're in a quiet neighborhood where twittering birds distract you--close the windows during your writing time. 10. Eat healthy meals at regular intervals. Avoid the distraction of a growling stomach or a hunger headache. If you're always thirsty, keep cold drinks within reach. A mini-refrigerator in your office, filled with bottled water and fresh fruit, an keep you from constantly running to the kitchen. How does an author connect with their readers? Like many things in publishing, there is not one way but many different methods. First, it takes an excellent book. The foundation of any new book has to include excellent, page-turning writing. So if you haven't mastered that element, keep it in focus and continue to work on your craft through shorter magazine articles and learning everything you can learn--such as at conferences and through how-to books. Yet many well-crafted books don't make it into the hands of readers. In previous entries, I've written about the many different snares and traps in the process of selling a book into the hands of customers. Yet as an author, I'm constantly looking for any avenue to connect with my reader. Why? While you may do it unintentionally, every author is in the process of building name recognition and a brand. You want people to love your last book so they are eager for the release of your next product. In recent months, the largest online bookstore on the planet, Amazon.com has launched Amazon Connect. Each day authors of all persuasions are joining this effort. Whether you have one book or many books in print, I believe it's worth knowing about and some level of involvement. Almost any book can be purchased on Amazon.com--whether it comes from a large publisher or it is self-published. The process is fairly painless--yet has some cautions. Amazon wisely forces authors to provide the name, email and phone number of a third party to "verify" that you are the author of the book. This verification person can be an agent, a publicist or an editor and they receive an email with a simple button to push. The books which you select are then verified and connected to your Amazon blog. To try out this system, I selected my last three published books and they were verified--but they were not connected until I made another entry in the Amazon.com blog. After I published this entry, the books instantly were connected to my blog--and to my author profile. 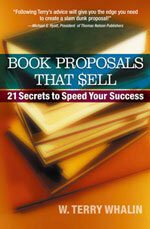 Here's a couple of my examples: Book Proposals That Sell and Running On Ice. Scroll down on these pages and you will see my profile and my Amazon blog entry. Notice within the blog, you are allowed to provide web links and other information. Here's how my author profile appears on Amazon. Is this connection the ultimate one that will solve all your book sales problems and connect you constantly to your readers? I'm enough of a realist to not push this connection too far. It's just one more tool to add to your arsenal of marketing efforts to reach readers. Kickstart Your Career With a Magazine Credit! It can take a beginner many months (or years) to finally break into the children's book fiction market. If you yearn to see your name in print, why not go where there's less competition? One great place to start -- writing nonfiction magazine articles. Nonfiction can be profitable because you can use the same research on several pieces. Find a topic you love, gather your information, and then craft several articles for different markets. Remember that children are most interested in the "how" and "why" of a subject, especially if you present it in a humorous or unique way. Longer how-to articles. These differ from straight activities because they require more of an introduction than, "Have you ever wanted to make paper dolls? Here's how!" Many magazines have theme lists for each issue, and want activities that also present information related to the theme. That same paper doll activity might be prefaced by several paragraphs on the history of paper dolls in the U.S., or focus on paper dolls manufactured during a particular decade. The "howto" element would follow, with clear, step-by-step instructions children can complete on their own, or with minimal adult supervision. How-to articles for older readers might involve self-help topics, or tips for improving relationships, getting organized, or landing a summer job. Break these more abstract topics into several steps and use catchy subheads to keep the article entertaining. Biographies. Many magazines need short biographies of adults whose lives are connected to themes for upcoming issues. When writing a magazine biography, focus on a small aspect of the person's life, such as a pivotal childhood experience that inspired him to take a certain path in adulthood, or the one or two accomplishments for which that person is best known. Or, for famous subjects, highlight some obscure achievements. Many magazines love to receive biographies of unknown people who had an impact on a big moment in history.